Ad Nauseam or Ad Infinitum? MI6 has got an interesting recruitment ad running in the quality press,including the Times Saturday 18 Feb 2012.It's very smart, and that's how it should be.It's an ad in plain clothes. It disobeys all the main "rules" of advertising but gets the psychology dead right.It wants to attract those that take the trouble to spot something that is normally not noticeable: in other words, the ad deliberately sets out to avoid the attention of the average Jo, (a normally undesirable approach for mainstream goods). Instead, it goes undercover, aiming to seek out those with greater perception, and rewards them fully once they start playing the game.It's a form of recruitment self-selection process that weeds out the time wasters. Everything about the ad is apparently dull and off-putting - picture, headline, daunting length of copy - until you get into it. 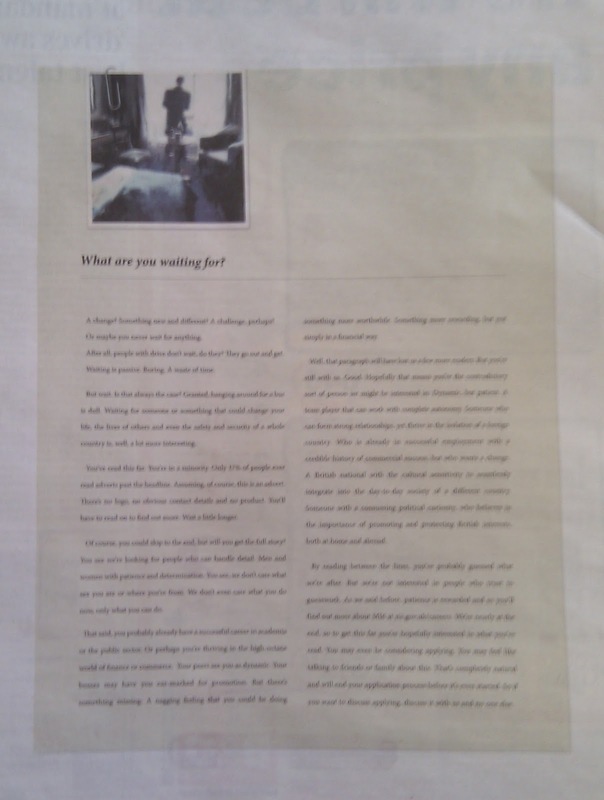 The copy is long, but it is well written, and belies the belief that people don't read long copy ads. The fact is that people will read as much as they need to - by choice, people read long articles and books everyday. Advertising, being normally an uninvited message, tends rightly to focus on succinct messaging and short copy, but this ad demonstrates that lengthy text is effective as long as it a) holds people from the start and b) allows the gist of what's being said to be articulated up front. There is no overt branding in the ad, and the conventional call to action is not only absent but prospects are "forbidden" from telling their friends and family that they are applying (for security reasons). On one level we have the exact opposite of the pass-it-on-share-all-Tweety Pie society we live in. The perceptive recruitment target will spot it because it's in disguise, because it doesn't quite fit what they feel should be happening on that page. And this is precisely the type of person the secret service want, Moneypenny. Author of Glitzch! the book that shows what British history would be like if rewritten using WRONG predictive text suggestions www.glitzch.com More seriously, aim to help clients achieve superior results via applying "psychological edge" to advertising and marketing campaigns.